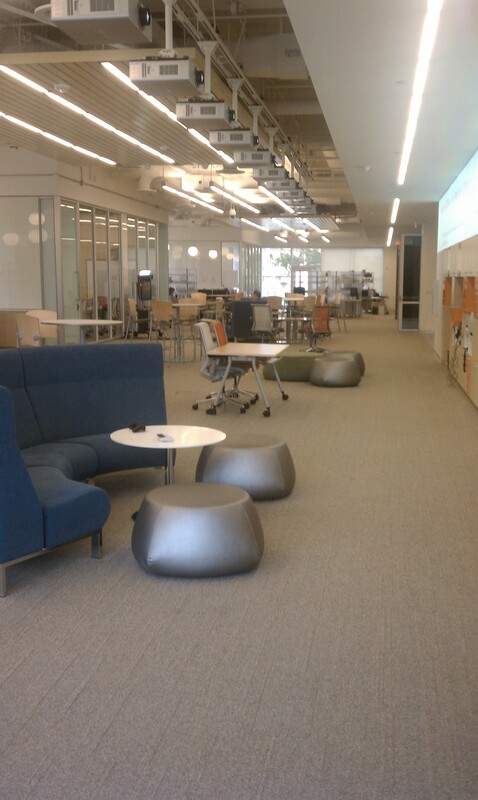 Yesterday, I took a tour of AT&T’s Foundry space in Plano, Texas. 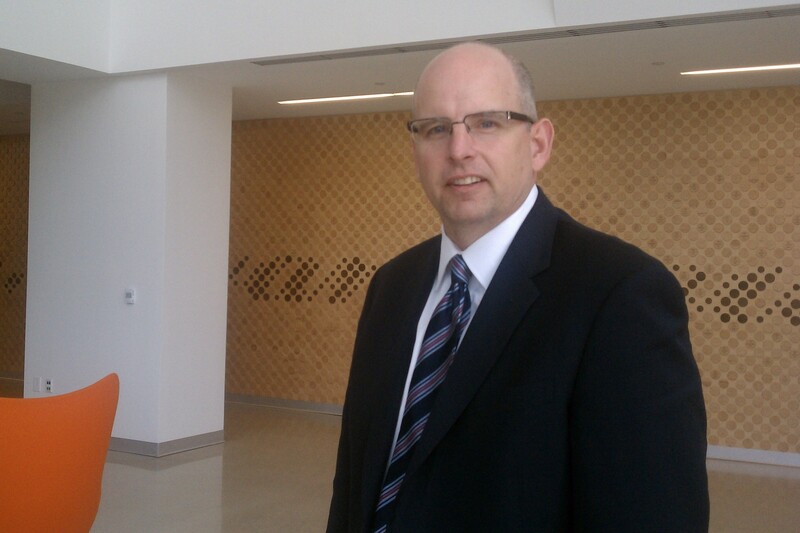 I interviewed Jon Summers, SVP of application and service infrastructure at AT&T, with other reporters, to try to understand the shift AT&T is making in how it approaches buying goods and services and brings new technologies and applications to its network. Afterward, I came away thinking AT&T has built itself a fun, collaborative space that looks like a Silicon Valley-style office, although it doesn’t quite have the true collaborative and thrilled-to-innovate feel that characterizes most startups. That’s okay, because AT&T isn’t exactly a startup. In the last four quarters, it has reported $125 billion in revenue, and billions of dollars in capital investments in its network. For me, the highlight of the lab was that the Foundry is home to a trial Long Term Evolution network. I asked for a demo and got one. The speeds provided on the download side were about 28.87 Mbps, and were about 10.4 Mbps on the upload side. This compared to speeds of 3.77 on the download side and 1.21 Mbps on the upload for an iPhone (s aapl) capable of maxing out on AT&T’s 7.2 Mbps HSPA network. So it’s fast, but sharing those speeds with others on a cell tower will bring them down. For comparison, Verizon has promised customers speeds of 5-12 Mbps on the download side and speeds of up 5 Mbps on the upload side. The network engineer who ran the test explained AT&T was using MIMO antenna structure and two swaths of spectrum: the 700 MHz it purchased at auction and the AWS band of spectrum it already owns (and wants to purchase more of by buying T-Mobile). When I asked about carrier aggregation, he said AT&T wasn’t using that for this demo. When I commented that this was the first LTE demo where folks didn’t try to max out the standard and show off 150 Mbps-download connections, he replied that this is because AT&T wanted to model real-world situations for the people coming into the Foundry space. 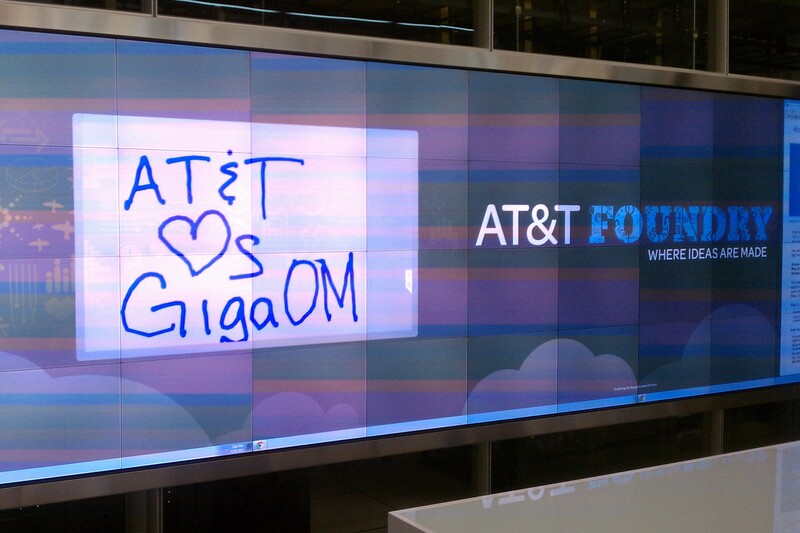 As a final bonus, I got to play on the giant touchscreen set up in the office, which, at 24 feet by four feet, is the largest infrared-based touchscreen currently used, according to an AT&T spokesman. The screen uses a strip of infrared sensors on top of the display to track movements, as opposed to cameras like the Microsoft (s msft) Surface Table or the HP Touch Display does. It was fun to pull down various menus and write a little message on the board. Thanks, AT&T for the fun trip tour. With AT&T’s murky marketing ploy of calling HSPA+ “4G”, can we expect them to be the lone carrier on the planet to call LTE “5G” — or do we think they’ll come clean and tell consumers they were just kidding? My bet is they’re going to call it 5G and every other carrier is gonna follow with their “5G” networks that will be identical to their current “4G” ones. That’s what happened here in canada with carriers suddenly rebranding their HSPA+ 3G network and calling it 4G. at&t was never going to call HSPA+ 4G, but thanks to T-mobile and even Sprint glorified Wi”fi”Max hotspot winning the re-definition of calling HSPA+ and WiMax as 4G, they were given the green light to market as such. 2 Gb (AT&T’s monthly data plan cap) Ã· 28.87 Mbps (LTE speed) = 9.5 minutes. Isn’t progress great? Did the network engineer happen to mention if they were running IPv6 on their LTE network? I ask because VZW is running v6 on their LTE network. Any carrier would be suicidally foolish not to go full IPv6 at this level. I know, it’s AT&T so you kinda have to temper that assertion…. At any rate, what little I’ve gleaned about the future tech for phone carriers is that it’s all going IP eventually, from the handset all the way to the router. That direction pretty much mandates IPv6. LTE is all IP. Simple as that. LTE does not mean carriers will be going IPv6. There is whats called Carrier Grade NAT.